✔️ SHOW OFF YOUR SENSE OF HUMOR - Who doesn't love a P00P emoji? 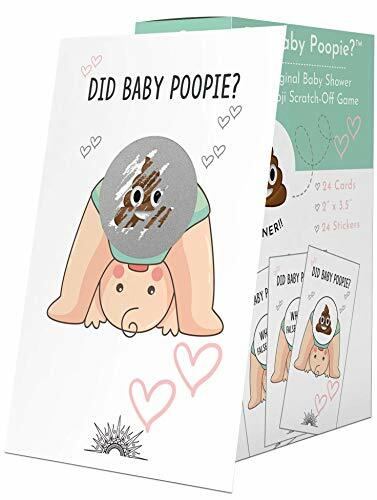 Our hilarious P00P scratching baby shower game will have your guests rolling in laughter once they see how ridiculous this game is. It's a fun lottery game that you can use for diaper raffles, door prizes, favors, ice breakers and more! You can even take it up a notch and hide lottery tickets under chairs or plates at your event. The ways to play are limitless! ✔️ QUICK AND EASY TO PLAY - In order for game play to begin, the scratch stickers must be applied to all 24 cards which takes less than 3 minutes. Once stickers are applied you simply hand out the lottery cards to guests and tell them to start scratching. If you're not into playing lengthy baby shower games or you just won't have the time at your baby shower, then this is the PERFECT GAME for you. Scratch and DONE! ✔️ GENDER NEUTRAL DESIGN THAT MATCHES ALL THEMES - We purposefully designed our game to blend seamlessly with any baby shower theme or decorations you may have. The card's soft muted tones easily compliment and won't over power your table decorations. So whether you are having a gender reveal, boy themed, girl themed, or gender neutral shower, our game will work effortlessly. ✔️ GREAT VALUE - Each purchase includes 24 lottery scratch off cards and 24 silver scratch off stickers which provides enough for 1 round of play for 24 guests. The stickers will need to be applied to the cards in order for game play to begin but this was done to ensure you have full control of the winning card should you have less than 24 guests at your event. ✔️ U.S. BASED COMPANY - Dreamed up by a stay at home mom with a sense of humor, our trademarked "Did Baby P00PIE?" baby shower game is one-of-a-kind. Feel good knowing that every purchase made will support our small-family owned business located right here in Austin, Texas.